Sometimes you just need dessert! Though dessert consumption has declined considerably in my household over the last year or so, both my mother and I are still fond of making and eating baked goods. Most recipes we used to enjoy can be made vegan-friendly with a few easy substitutions! One of the things I used to be a fiend for was brownies. Chocolate, chocolate chip, peanut butter; I loved them all. Looking back, I cringe at the amount of dairy- and egg-laiden desserts consumed as a kid. But that doesn’t stop me from breaking out the mixing bowl and making updated versions of the old favorites. On a recent trip to AZ, I picked up a bag of Dandies vegan marshmallows from Green. I’ve been dying to make something with them ever since, and lurking in my brain was a memory of making “blizzard” cookie bars in 6th grade Home Ec. After a little tweaking, the result isn’t the same, but the taste is just as fantastic! I made mine with applesauce and find that the lighter texture compliments the chewiness of the walnuts quite well. 1) Preheat the oven to 350°F. Line a cookie sheet with aluminum foil. This makes for easier bar removal and less cleanup later on! 2) Mix the Earth Balance, applesauce, and sugars together until combined. 3) Add the “eggs”, vanilla, and baking soda. Mix well. 4) Slowly beat in flour until dough forms. Note: dough made with applesauce will have a slightly “stretchy” texture to it. 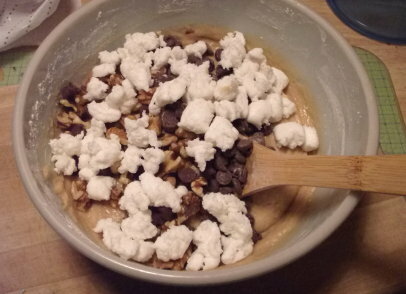 5) Fold in the chocolate chips, walnuts, and dandies. 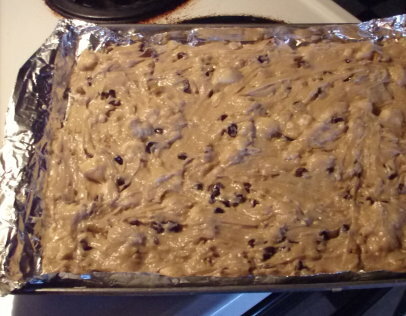 6) Spread dough in the prepared pan as evenly as possible. 7) Bake for 20-25 mins., or until lightly browned. Your kitchen will probably start to smell like s’mores when the Dandies heat up! 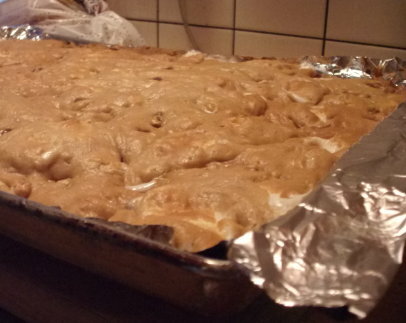 Bar texture may be more springy/spongy than expected due to melting of the marshmallows, but don’t worry–they’ll taste fine! 8) Cool completely in pan before cutting into 24 bars. Store in an airtight container, preferably between layers of wax paper.